Until now, I've never felt any urge to write about books that I read for my academic interests. With ample discussions, term papers and academic book reviews mandated of such books, there's been scarcely any energy or motivation to write about them here. But yesterday, I finished reading two exceptional books that I'm quite eager to share and write about; a rare emotion that accompanies academic prescription. The first book is by Dr. Robillard, a sociology professor from University of Hawaii. In the mid 1980s, Dr. Robillard was diagnosed with ALS, a motor neuron disease that leads to slow degeneration of motor neurons, muscle atrophy and paralysis of the whole body. Dr. Stephen Hawking is another well-acclaimed professor and scientist afflicted with ALS. The prognosis is usually death within a few years of the onset of the disease. However, Dr. Robillard lives after more than 20 years of being diagnosed with ALS, and continues to teach at the University of Hawaii. He strives to lead a normal life, and his strong-willed spirit keeps him extremely productive and creative. 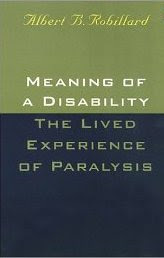 This book is an autobiographical account of his life with ALS, and what it truly means to be physically disabled. More than the debilitating effects of paralysis, those with ALS acutely miss their ability to speak and communicate. This would be especially true for someone as accomplished, intelligent and articulate as Dr. Robillard. The focus of this book has been to bring to light the significance of simple talk and face-face communication in our social structure, and its intricacy in defining us as individuals who are socially competent and intelligent. Using his own experiences, Dr. Robillard critically analyzes the shift in social structure when a person is struck with a disability to talk and be heard. The method of analysis he has employed is called ethnomethodology. Our ability to carry on a conversation is often taken for granted. It is a mundane routine. But it's fascinating to learn about the the extent of skill and subtlety involved in simple social interaction. Conversations are highly bound by temporal parameters. A slight miss in the rhythm, an averted gaze, a shift in body posture, an incorrect intonation, a careless gesture, and meaning is lost. Thoughts remain stagnant, and are never transmitted. The person is never understood for what they are and what they want to share. It goes to show how much our identity is tied with these social building blocks. Shatter the blocks, and our individuality as a person in society drastically gets altered. Our personality is shaped through our expressions. Without the ability to express, especially spontaneous expression of thoughts through words, our personality is trapped within our body. This was a very interesting take-away from the book, although it might sound very intuitive. Dr. Robillard's experiences go beyond just common-sense perception. In addition, the book emphasizes something very fundamental - that the body by itself is a very crucial component of the social comprehension of how competent a person is. It is sad that most of us fall into the notion that a dysfunctional body and dependence due to it, is a sign of incompetence. An active, alert mind, imprisoned inside that body is often ignored. Respect to an individual diminishes with the regression of the body's functionality. Basic dignity is overlooked, and empathy is misdirected through patronizing talk, actions and behavior. Dr. Robillard's accounts have given me a very realistic understanding of the attitudes, angst and expectations of a person with a physical disability. And for primarily this reason, I would recommend this book to those who want to learn how to understand and treat people with physical challenges. The book is well-written, precise, analytical and grounded in empiricism. Some of his words carry the inevitable marks of hurt and frustration. Dr. Robillard composed the entire book by lip-signing (a method of communication he devised with the help of his wife and students), every word to his students, who typed the manuscript, while his daughter helped with editing. I want to say that I'm inspired by his perseverance, his ambition, motivation and his strength of will, but he resents such statements. To say so is putting him outside the circle of normalcy. He is a normal man, a thoughtful and analytical professor, who is a prolific writer of remarkable books and papers, teaches courses, and conducts research, befitting his intelligence and personality. And that inspires me.